Below is an explanation of how CMP Products calculates Peak kA current short circuit current ratings for each specific customer application and installation. CMP Products has carried out over 300 short circuit tests, however it is not viable to test for every fault current, cable cleat, cable size/type and fixing centre configuration. 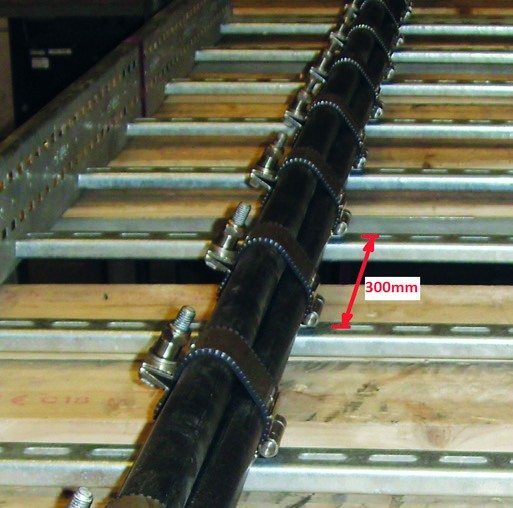 In order to replicate these tests CMP is continuously developing simulation software and can undertake project specific testing on the cable cleat, cable and cable tray or ladder intended to be used on the installation. CMP also has the experience to reliably calculate what the Peak kA short circuit rating will be, based upon the expansive test data it holds following the comprehensive testing programme undertaken. Beginning with a short circuit test at 300mm fixing centres, the maximum safe Peak current in kA that the cable cleat under test can restrain is established and achieved. In the example below the cable cleat successfully passed the tests in the IEC 61914 standard at 190kA on Ø36mm cable @ 300mm fixing centres. Now that the maximum force per cable cleat has been established, the formula is transposed to calculate the maximum peak fault current for different fixing centres, cable diameters etc. Now that the Ft for this application has been established, the ip can be calculated. Experience shows that this value is always lower than can be achieved in a physical test. This confirms that there is a safety factor element included in the IEC 61914 calculation; this is a good thing as it means that calculated values are always on the conservative side. However it also means that the Ft or maximum force per cable cleat ratings taken from test results should only be used on fixing centre intervals which are shorter than those actually tested, as a basis for any calculated ip’s. Calculating the opposite way is not recommended as it contradicts the safety factor employed in the standard and gives unrealistic and unachievable ip’s. This gives a calculated ip of 212.13kA – THIS IS DANGEROUSLY HIGH! 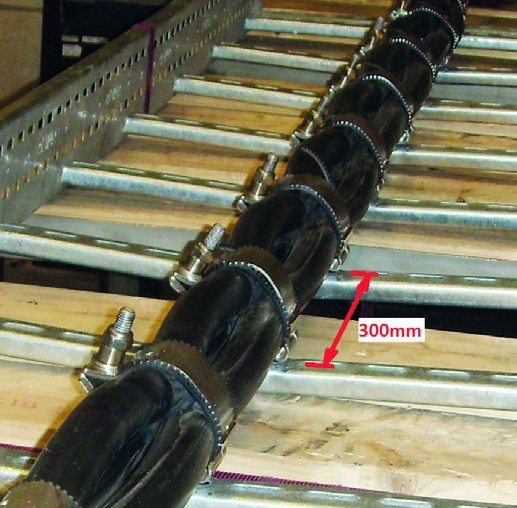 Only 190kA was achieved @ 300mm fixing centres under physical test and that showed that the cable cleat was very close to its maximum strength capabilities. Only use the Ft or max force per cleat ratings from CMP test results on shorter fixing centres than those intended to be used, as a basis for any calculated ip’s. Calculating the opposite way is dangerous, as it contradicts the included safety factor in the standard calculation which gives unrealistic and unachievable ip’s. If 500mm fixing centres are required, use the 300mm centres force per cleat CMP test data as a basis for the ip calculation. If 900mm fixing centres are required, use the 600mm centres force per cleat CMP test data as a basis for the ip calculation.